As if in acknowledgement, the somber walls of Heidelberg’s Thingstaette echoed these greetings, chanted in German and Hawaiian by students of Ka ‘Imi No’ auoo o Hawai’i Nei. It was 24 July, 2004, a day for which Roselle Bailey and the members of her organization had been preparing for four years. The process began when Mrs. Bailey first visited the site in 2000. Built during the early years of Nazi rule, the 8000-seat open-air theatre on Heidelberg’s Heiligenberg was one of a series of similar structures throughout Germany. Though completing only 40, Adolph Hitler had grandly planned to construct 1500, which he intended to use as sites for political assemblies. The various Thingstoetten which remain display many of the best qualities of 20th century German architecture. Designed according to ancient Greek principles, they feature excellent acoustics and expansive stages. This makes them fine venues for performing arts of all kinds. However, association of these places with Nazism has made Germans of today squeamish about using them. Consequently, people show them little respect. In Heidelberg’s Thingstoette, for example, weeds sprout from the seats, and displaced stones lie forlornly on the stage. So much broken glass litters the area that Ka’Imi’s dancers had to wear ballet slippers to protect their feet. Why, then, would a Hawaiian cultural organization want to have anything to do with such a spot, let alone spend months preparing to perform therein? In Mrs. Bailey’s words, “We need to ho’ oma’ ema’ e (cleanse and purify) the place.” Doing this, she hoped, would help Germans come to terms with the grim past the Thingstaette symbolized, and move toward a more peaceful future. She also saw this as an opportunity for hula students in Europe, the U.S. mainland and Hawai’i i to collaborate in a project that could help ho’ oma’ ema’ e thoughts and lives of people everywhere. 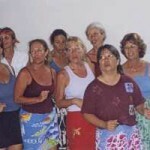 Accordingly, during the 2001 Eo, E Emmalani I Alaka’i festival, she issued an open invitation to join Ka ‘ Imi in Heidelberg in 2004. Coming as it did a month after the terrorist attacks of September 11, her proposal caused quite a stir in the assembled company. Nevertheless, 29 students from Maui, Kaua’ i, Samoa, O’ ahu, Germany, California, and Switzerland responded. 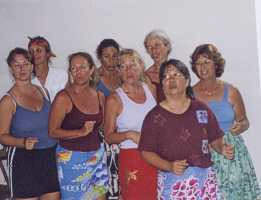 So did Pattye Puakea Wright of O’ ahu’ s Halau Hula Puakea o Ko’ olau and recording artist Antion of Kaua’ i . Besides those who would perform the program, scores of relatives and friends, the kokua without whom no Hawaiian organization can function, swung into action. Upon the German ‘ ohana fell most of the logistical work. Arranging food, accommodation, and ground transport for a group that would assemble at various times and come from different places could have been a travel co-ordinator’s nightmare, but the Europeans did the job with intelligence and grace. Valhalla-ward across the picturesque span were disappointed to learn that the thunder came mostly from produce trucks rolling market-ward, Warms proved to be a charming and hospitable place. A tourist publication touts it as Germany’s oldest town. With its massive Romanesque cathedral squatting like a hen in the midst of the city’s venerable Celtic, Roman, Jewish, and Gothic remains, Worms, oldest town in Germany or not, is rich in pleasant walks, intriguing museums, and bustling cafes. Yet touring the country was not high on the agenda. 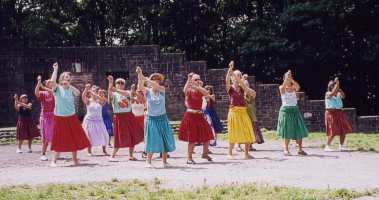 As it must with any performing group, rehearsal and preparation took precedence. 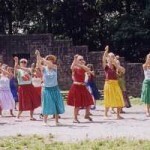 With students living in so many places, practices together before everyone assembled in Worms had been impossible. Thus the Nibelungenturm’s spacious meeting attic quickly turned into the center of activity, as rehearsals ran from morning until afternoon and evening. Even so, not until the day before the Heidelberg event was the entire company able to meet. All too quickly performance day arrived. It seemed made to order. Even the Heiligenberg’s weather beckoned the visitors; the stiff broom of a sudden and violent thunderstorm the night before had swept the sky clean, just as Ka ‘ Imi members had swept the stage the previous day. A light breeze ushered the guests uphill, and trees clapped their hands in greeting. Soon the hillside rang with sounds of pu, oeoe, guitar, ipu, ‘ukulele, and pahu, and human voices returned nature’s welcome. What happens after a performance one has spent months preparing is over? Ka ‘Imi’s students had little time to ponder this. 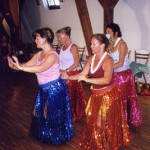 After a crick lunch on the theatre steps, they were off to dance at a “Hawaii Party” in Keltern-Niebelsbach, a small town near Pforzheim, an hour’s bus ride away. Then it was on to Ammmersee, a lakeside resort area near Munich for a few days of rest, cultural presentations to local residents, and preparation for a final program in Mannheim’s Luisenpark cultural center. 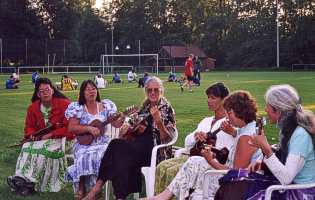 This performance and farewell supper following it lasted until the early hours of 1 August, when most of the Hawaiian contingent flew home to resume normal lives. Now that they have unpacked suitcases, washed costumes, and developed photos, they will be able to reflect on what they have accomplished, and what new adventures await them. 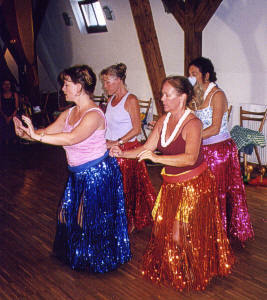 Sharon leads dancers from Germany and Hawai’ i as they practice on the immense Thingstaette platform. Practicing in the Nibelungenturm attic. FUN WITH FOOD: Some of us enjoyed getting acquainted with local cuisine. 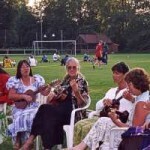 SPONTANEOUS MUSIC on Aloha Tag near Ammersee. The footballers were unimpressed.